Since we'd already done the main highlight in Chengdu (the Pandas), we decided to spend our full day here doing a day trip out to Leshan (a 2 hour drive away) to see their giant buddha. 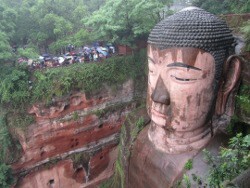 He's 71m tall and carved into the side of a cliff where 3 rivers meet. I'll admit that although I don't subscribe to any religion, I do go and look at churches and temples, like I suspect most people do. But, after a certain number of them in a short space of time, no matter how spectacular, they do all get a bit same-y for me. Because, I suspect, they hold no particular relevance for me, other than a nice or interesting old building. It was spectacular to see. The area around it is lush and felt quite tropical with the light rain. 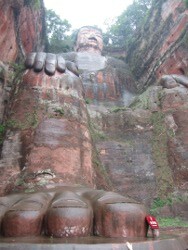 The first thing you see is the giant buddha head (apparently his ears are 7m high!) and then you walk (or get shoved by the mass of tourists, all with a leader yelling into a microphone, of course) down a steep path on the cliff to get to his gigantic feet! He's *huge*. Didn't do much else here, except climb a lot more stairs and try an Apple Fanta. And then we had a bit of a struggle to find our driver and a bit of a worrisome drive home because it seemed like he spent the entire 2hrs trying to keep himself awake (literally slapping himself and shaking his head!!). Anyway, we arrived back in one piece and after a quick bite, I went off to wander the Tibetan streets surrounding our hostel. 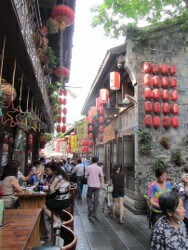 For dinner this evening we went back to the JinLi area and ate food from the stalls. I tried some chicken dumplings, cake with chicken (which was basically chicken cooked into the middle of a dough thing, the shape of a small pita) and roasted duck spring roll, which was the best. For dessert we had these weird strawberry ice cream in a cake things that had been deep friend. Hmmm, healthy!